Paradigm Electronics is a manufacturer of high performance loud speakers and subwoofers. 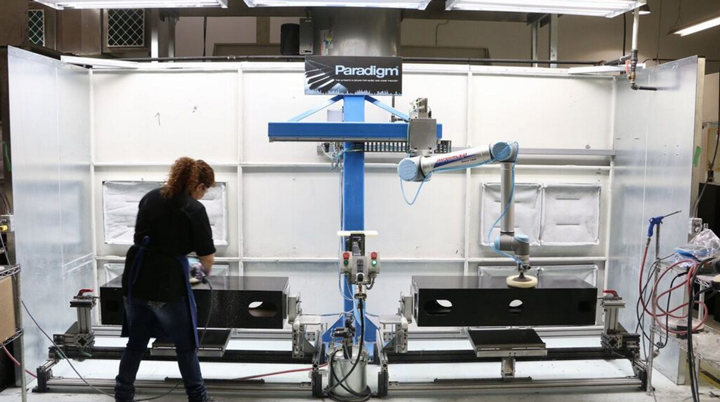 In trying to meet demand on labor-intensive products, Paradigm has now implemented Universal Robots in polishing applications, resulting in significantly increased production throughput eliminating bottle necks while improving the work environment. When Paradigm Electronics launched the “Midnight Cherry” finish on a line of new speakers, the market quickly embraced the new product made entirely in-house at the Toronto-based manufacturer. “Dealers loved it, our customers loved it, and we were faced with a challenge to make even more than we anticipated of these new cabinets,” says Director of Operations Oleg Bogdanov, who quickly realized that it would take too long to fulfill all demands. Paradigm looked to robotics as a solution as the company had already implemented one robotic cell with a cartesian type robot. “But the cartesian robot required a lot of protective devices around it for the protection of the worker. It really didn’t allow for an employee to work in conjunction with the robot at all. The application of buffing is one that requires a lot of observation and collaboration by the operator, so having the work being done in a remote cell just didn’t seem to be a workable solution,” says Senior Manager of Production Services at Paradigm, John Phillips. Paradigm had an industry expert with a specialty in robotics applications come in, making the company aware that collaborative robots from Universal Robots could be a solution to the Midnight Cherry challenge. The UR robots are a new type of robot classified as collaborative due to their interactive design that makes it easy to set them up for a new task as well as their built-in safety system that enables the robot arm to automatically stop operating if it encounters objects or people in its path - a radical break away from traditional industrial robots that usually stay hardwired behind safety guarding, fenced off from people. At Paradigm, the UR10 handles the most strenuous part of the polishing, using the coarsest buffing compounds where after the last phases if needed are manually applied using a higher grit compound. “Collaborative robots was a new technology and it lead to further investigation. This kind of robot allowed us to have a human and a robot working in the same workspace. They’re now working in a pendulum type of an operation where they can safely interact, allowing the human to check whether the robot has done an adequate amount of work before the final polishing is handed over to the human. It’s a very hand-in-hand kind of operation between the two,” says Phillips, emphasizing the simplicity of the robot cell. The implementation solved Paradigm’s back log on the popular cabinets by increasing throughput by 50%. Before choosing the UR robot, Paradigm conducted a thorough research of the collaborative robot market. “Once we realized that a collaborative robot was a viable alternative for us, we did our homework and checked around the rest of the opportunities that were out there from different manufacturers and we found that for our application, the UR robot was not only the best robot for the application, but it was also the most cost efficient,” says Phillips, who estimates the return of investment to be about 14 months. 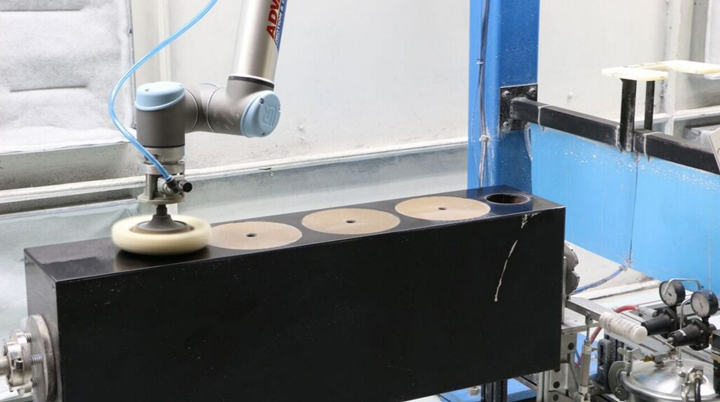 For the loudspeaker manufacturer, it was also imperative that the robot would be able to perform the polishing applying a specific force. “The robot has taken over a really delicate job, you just make one wrong move with the sand paper and you leave a mark on the cabinet that cannot be repaired. So a robot has to be as delicate and as sensitive as a human, pressure has to be applied properly,” explains Bogdanov. The UR robots have built-in, adjustable force mode feature that is easily pre-programmed for specific applications. “If too much force is applied, the surface heats and the results go the opposite direction to what you’d hoped. So having the ability for the robot to work to a specific force was a huge advantage. We were aware of technologies that allowed for a force feedback system but they were actually as expensive as the entire UR Robot was to us. So it was quite exciting to find that it had capabilities of force feedback within its inherent structure,” says Phillips. 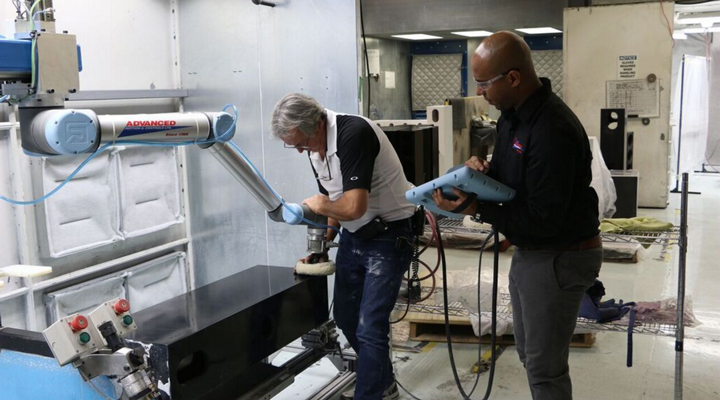 The UR10 robot was first introduced to Paradigm by distributor Advanced Motion & Controls who brought the robot for an on-site demo. Technical Sales Representative Ben Pinto started off by showing the team how they could easily program the robot by simply grabbing the robot arm. Phillips calls the UR robots very “cutting edge” compared to their old cartesian robots, not only when it comes to safety but also in the daily operation and programming requirements. “The UR robot is very simple for the operator to start her day and carry on. The various programs needed are very easily found in a menu, the operator simply chooses the program for the particular job that she’s doing that day and within a couple of key strokes, she’s operational. In our old robots, there were a lot of other processes that required a technically capable person to come and set the robot up,“ explains Phillips, stressing that no Paradigm employees lose their jobs to robots. As Paradigm installed the UR10, they made sure it would comply with any of the health and safety requirements of their local jurisdiction. “We work with an engineering group that are experts in the interaction of machines and humans. They were comfortable with the kind of operation that we were doing, having collaborative operation happening with humans able to work directly with the robot,” says Paradigm’s Manager of Production Services, who is now investigating future applications for the UR robots. 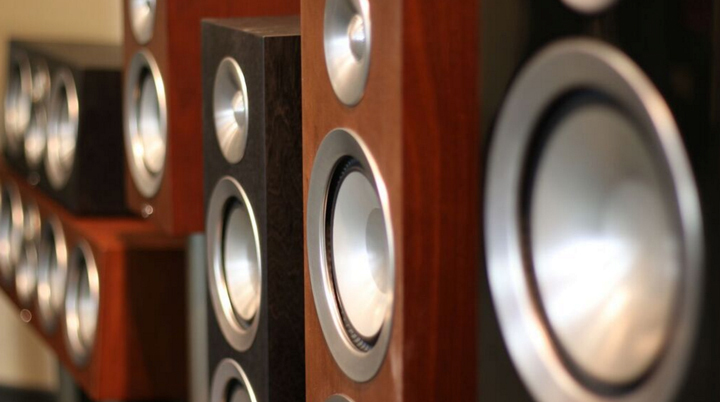 Paradigm Electronics Inc. designs and manufactures speakers. It offers bookshelf, center, custom amplifier, custom outdoor, floorstanding, in-wall/in-ceiling, soundbar and subwoofer, surround/rear, and LCR speakers. The company also provides technical support services. It serves customers through retailers in the United States, Canada, and internationally. The company was founded in 1982 and is based in Mississauga, Canada.The entire production from R&D to finished product takes place in-house at facilities in Canada. Universal Robots pioneered collaborative robotics and remains a market leader and first mover within this emerging technology. The product portfolio includes the collaborative UR3, UR5 and UR10 robot arms named after their payloads in kilos. Since the first UR robot entered the market in December 2008, the company has seen substantial growth with the user-friendly cobots now being sold in more than 50 countries worldwide. Average payback period for UR robots is the fastest in the industry with only 195 days. The company is headquartered in Odense, Denmark, where all development and production is carried out. U.S. offices are located in Ann Arbor, New York, Los Angeles and Dallas.